Mark Wallace's 14-year run of consecutive County Championship appearances for Glamorgan is set to come to an end because of injury. The 33-year-old wicket-keeper suffered a calf injury while batting against Northamptonshire on Tuesday. Wallace is now doubtful for Glamorgan's next match away to Gloucestershire, starting on 22 September. His injury came in his 230th consecutive Championship match for the Welsh county. "I've pulled or torn a calf, a bit of an old man's injury - not a great day for me after I got a heavy blow in the box," Wallace told BBC Wales Sport..
"I'd just managed to recover from that and managed to blow a calf. These things happen." He had made 27 not out when he suffered the calf injury setting off for a run and was forced to retire hurt. Wallace, standing in as both captain and opener, expects he will miss the final Championship game away to Gloucestershire starting on 22 September. "I'm probably due an injury to be fair and I think I'm struggling for the next game realistically," he added. Only three other players have played more Championship games in a row for Glamorgan. Opening batsman Arnold Dyson played in 305 successive games between 1930 and 1947, while Hadyn Davies played in 282 games from 1947 to 1957. The County Championship record is held by Ken Suttle, who made 423 appearances for Sussex between 1954-1969. Wallace made his debut against Kent in 2001 after replacing Adrian Shaw, who was forced to pull out of the team with illness. "I would have taken 230 games in a row when I got called up to go to Maidstone in 2001, so I can't really grumble," Wallace said. "I'm pretty happy with 230 games in a row and someone else will have a crack next week." 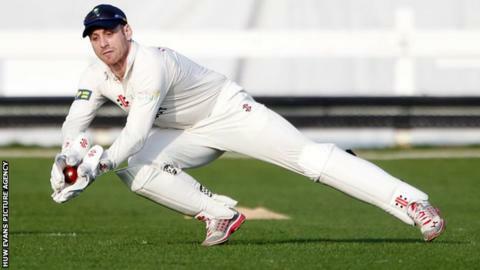 Chris Cooke is likely to take over wicket-keeping duties against Gloucestershire in Wallace's absence. Just 37 overs have been bowled in two days at Northampton, with David Lloyd hitting a career-best 64 not out and Rory Kleinveldt taking five wickets as Glamorgan reached 166-6 between the showers. "I think we've actually done pretty well today, it's been a tough wicket to bat on and tough conditions. I thought David Lloyd played fantastically," Wallace said. "Rory Kleinveldt is an international-class bowler but David Lloyd has come from strength to strength this season and has played really well today, an innings of real maturity. "If we get to 220 that's probably a par score and then we'll have a good crack with the ball."